The Renaissance was not all art and architecture, for many people the dinner table held as much splendour and spectacle than any painting or sculpture. Nowhere was this more apparent than in the dessert course, where sugar was not just a food it was ‘an artistic medium of tremendous flexibility’. In AVM Curiosities’ Introduction to Renaissance Sugar Sculpture this tasty and transient medium is explored. Through historical images and contemporary objects the story of our sweet tooth will be told; from form and function, to trade routes and techniques, visitors will learn about the artistry of sugar and how in the Renaissance you could assert your power, your politics and your status, just through dessert. Introduction to Renaissance Sugar Sculpture | Renaissance Late | The National Gallery, London | Room 32 | Friday 19 May 2017 | 6.15, 7.00, 7.45 & 8.30pm sessions (approx 15-20 minutes) | FREE ENTRY | Click here for more information. Also look out for AVM's Cherry Marchpanes at the "secret bar". Pride, Prejudice & Perceptions is an interactive sensory exploration of Jane Austen’s Pride & Prejudice, created by AVM Curiosities & Type Tasting for the British Academy’s Literature Week. Taking inspiration from the typography found in three editions of this classic novel, Pride, Prejudice & Perceptions uses type, sound, sight and scent to serve one story three ways. Part of the Open Senses Festival. Alabaster Ruins by AVM Curiosities is on show as part of the exhibition, Collecting Europe, at the Victoria & Albert Museum | Cromwell Road, London SW7 2RL | The installation can be found in The Dorothy and Michael Hintze Galleries, Room 21a | 1 - 7 February 2017 | Click here for more information. Victorian Afternoon Tea | in collaboration with Benugo | at the Victoria & Albert Museum, London | Sundays from 13 November 2016 | 3-5.30pm | £30 per person / £35 with Prosecco | Booking Essential | Click here for more information. Alabaster Ruins is a contemporary sugar sculpture, taking inspiration from stone, marble and the banqueting tables of the Elizabethan Era. The installation celebrates European architectural heritage, bringing together fragments of English Tudor, French Gothic, German Baroque and Classical Greek structures. Throughout the early modern period sugar was a true luxury, with sugar sculptures becoming synonymous with status, identity and power. Drawing on this history, Alabaster Ruins combines ancient and modern techniques, using a 17th century ‘sugar-plate’ recipe alongside cutting-edge 3D printing technology. The forms, scanned and cast from the V&A’s own collection, are transformed into transient ruins - pointing to the ephemerality and consumption of European culture, and the museum’s urge to preserve it. Alabaster Ruins is part of Collecting Europe at the Victoria & Albert Museum | Cromwell Road, London SW7 2RL | It will be displayed in The Dorothy and Michael Hintze Galleries, Room 21a | 1 - 7 February 2017 | Click here for more information. In December 2016 theatrical performance company Traces presented an immersive experience at Fenton House, Hampstead. For one month the National Trust property was transformed by over 80 invited artists, as guests were invited to wander through the abandoned rooms and unpick the secrets of the Gee family. Fictional narratives were interwoven with factual discoveries and site-specific installations, as visitors explored the reimagined Georgian house with map and candle in hand. Included in the specially commissioned objects was an 8-course menu of scented napkins in the dining room created by AVM Curiosities. The installation fused 18th century napkin folding techniques with modern flavour encapsulation to create the historically inspired sniffable menu. Founded by food historian Tasha Marks, AVM Curiosities explores the relationship between art and the senses. 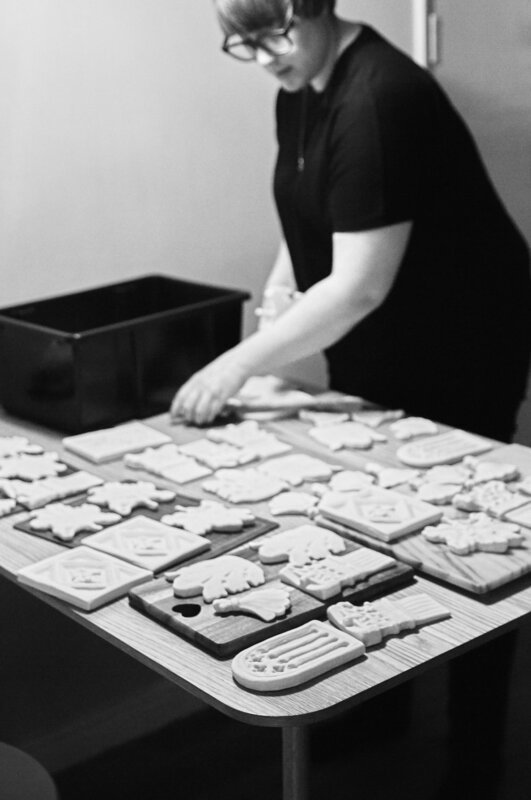 Championing the use of food as an artistic medium, projects range from museum-style exhibitions and sculptural installations, to interactive lectures and limited-edition confectionery. Alongside edible artwork, AVM Curiosities also work with scent, exploring the powerful mnemonic possibility of the sense of smell - closely linked to long-term memory. By incorporating evocative fragrance into the museum context, scent becomes a powerful tool to enhance and deepen our engagement with artwork and artifacts. At this year’s Frieze Masters, AVM Curiosities have produced a bespoke scent-chamber in response to The National Gallery’s Saint Francis Renounces His Earthly Father by Sassetta. Using porous lava rocks infused with scent, this 15th century painting has been paired with the aroma of frankincense and myrrh, for its religious connotations and link to Egypt where the resins are harvested, and where Saint Francis’s is believed to have traveled to in 1219. Adding further depth to the aromatic medley will be a base note of moss; an underlying earthy tone, and a fragrant link to Saint Francis, patron saint of animals and the natural environment. AVM Curiosities are proud to announce that as part of Queen Caroline's Garden Party 2016, we have collaborated with a new ice cream partner, Ruby Violet, to create a pop-up 18th century ice cream parlour. Join us on the stunning grounds of Kensington Palace from the 18 - 21 August to learn about the history of ice cream with food historian Tasha Marks, explore the ice cream themed cabinet of curiosity, and sample authentic Georgian flavours courtesy of Ruby Violet. You'll be able to choose from Apricot & Orange Flower Blossom, Brown Bread & Marmalade Ice Cream, Chocolate Water Ice, and the controversial Cucumber and Ginger Water Ice! Aroma-Tour & Soundscape | Inspiration Late | The National Gallery, London | Room 34 | 22 July 2016 | Photos: Tasha Marks & Bella Millon. Join AVM Curiosities this summer as the circus rolls into town at the Royal Academy of Arts 'Summer Circus’: bringing the gallery to life with spectacular installations and performances, where the surreal world of the Victorian circus meets the RA’s contemporary Summer Exhibition. Explore the galleries after-hours as acrobats, musicians and entertainers perform against a backdrop of 1,200 colourful works of art, or experience the RA’s historic Courtyard like never before as you visit the dark circus drawing salon with Art Macabre. A night not to be missed, where alongside the circus tents, acrobatic displays and fantastical performers, you can sample AVM's Alcoholic Candy Floss at the Street Food Market… a taste of the circus with a grown-up twist. Alcoholic Candy Floss Stall | The Summer Circus | The Royal Academy of Arts, London | Saturday 23rd July 2016 (7 — 11.45pm) | Tickets £42 | Click here for more information. Alongside AVM Curiosities' scent chambers at the National Gallery Late on July 22nd, we are delighted to provide you with a preview of Troy Hewson's accompanying soundtrack. Inspired by the paintings in Room 34, the soundscape will be played in the gallery throughout the evening. Plus it can be downloaded here for your audio amusement pre or post event. Aroma-Tour & Soundscape | Inspiration Late | The National Gallery, London | Room 34 | Friday 22nd July (6-9pm) | Guided Tours at 6.30, 7.30 & 8.30pm | Click here for more information. In celebration of the Painters’ Paintings exhibition AVM Curiosities have taken the paintings in Room 34 of the National Gallery as their inspiration, responding to the work with four specific scent-chambers that have been created to compliment the work. The four scents are not direct readings of the paintings but instead a series of stories that make you consider the work in a different way. Accompanied by an 18th century soundscape by the contemporary composer Troy Hewson, the subtle sensory changes in the room aim to engage and inspire in equal measure. Aroma-Tour | Inspiration Late | The National Gallery, London | Room 34 | Friday 22nd July (6-9pm) | Guided Tours at 6.30, 7.30 & 8.30pm | Click here for more information. Plus bonus 007, sniff right near where James Bond & Q sat in Room 34. Lickable Leighton: An Edible Architecture Experience | Created and Produced by AVM Curiosities | Leighton House Museum, Holland Park, London | Friday 17 June 2016 | Photos: Chloe Rivers. 'Leighton House Museum has teamed up with award-winning food historian Tasha Marks to celebrate the acquisition of Frederic Leighton’s Interior of the Cappella Palatina, a jewel of a painting, which captures the artist’s fascination with the ornate interiors of Italy and beyond. Lickable Leighton: An Edible Architecture Experience | Friday 17 June 2016 (5.30-9pm) | Leighton House Museum, 12 Holland Park Road, London, W14 8LZ | Tickets £5-7 (FREE for Art Fund) | For more information please visit the museum website or eventbrite listing. *Please note that entry does not guarantee participation in the tastings. Edibles will be issued on a first come first served basis. 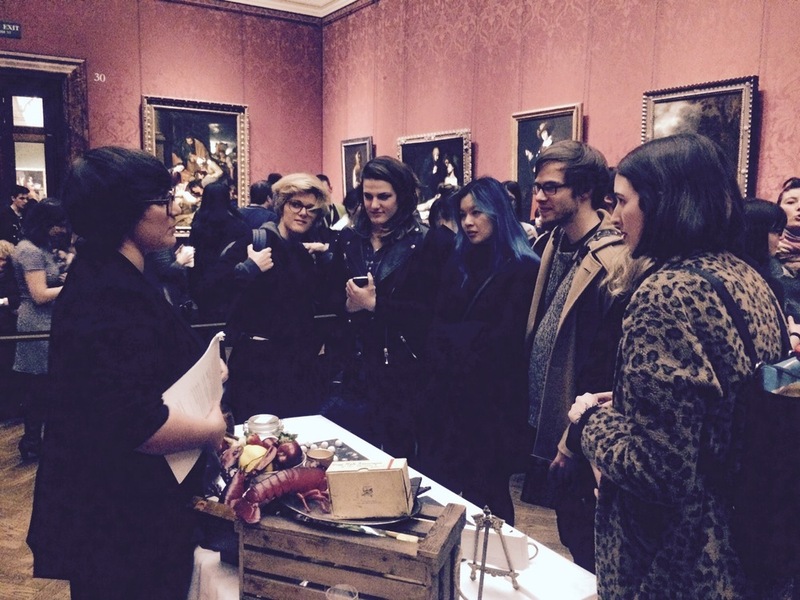 Historical Aphrodisiacs | The National Gallery, London | Room 30 | Friday 12 February 2016. Start your Valentine's weekend with an evening of special events inspired by themes of love and romance at The National Gallery. Expect live music, drop-in drawing sessions, guided tours and a whole host of free activities - plus don't miss the pop-up bar in the Sainsbury Wing Foyer and the last late opening of Visions of Paradise. The evening's festivities include; Fascinating Fascinators with the Glam Hatters, The Language of Fans with the curators of the Fan Museum, Courtly Dancing with dancers and musicians from Renaissance Footnotes, and Historical Aphrodisiacs with AVM Curiosities - join us in Room 30 for this titillating taste of history. Historical Aphrodisiacs at The National Gallery, London | Room 30 | Friday 12 February | Event from 6pm | Sessions 7–7.30pm & 8– 8.30pm | Click here for more information | FREE ENTRY. Photo Selection: Textures from the Late at Sir John Soane's Museum | 4 December 2015.